From caves to cookery, Scotland's charismatic capital offers up some fascinating venues. For something totally different, try The Caves. This spooky stone-walled venue has been established in a previously undiscovered sub-structure of Edinburgh's South Bridge, and is also the former home of The Oyster Club, a supper club for intellectuals founded in the 1770s. The flexible family-run venue can cater for small dinners for 20, to drinks events for 600. The owners can arrange pipers, ceilidhs, dancers, murder mystery parties, ghost tours and medieval banquets. They can also recommend photographers that will capture good quality images in the low light. DMC Hello Scotland senior project manager Kirsty MacNaughton says she used the venue for a recent event because the atmosphere is different to other spaces in Edinburgh. She adds: "The staff and venue are very flexible so there is scope for creativity. It's very dark, so combining it with a ghost tour works well. It's also great for a real party night because it stays open until 3am." This Grade A-listed former church has been totally refurbished and only opened to the corporate events market in March this year. The venue is now beautifully decorated in a gothic style. The main event space has purple walls and curtains and is complete with a state-of-the-art sound and lighting system. It can hold 350 for a reception, 140 for a black tie dinner on long benches, 240 theatre-style or 40 in a boardroom meeting. There are smaller booths in the downstairs bar that fit ten, and guests can borrow musical instruments or play on the piano for a Celtic jamming session. The venue regularly hosts ceilidhs and bands, and is open until 3am. 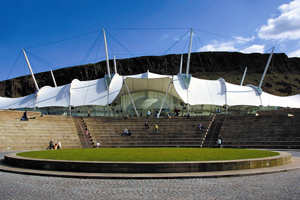 For larger parties, try the main glass-walled event space at the visitor exhibition centre Dynamic Earth. It can hold up to 1,200 for a reception or 550 for a banquet. It also has a balcony that overlooks the Holyrood Parliament building and a soundproof tunnel that allows one area to be a disco without disrupting guests in the main space. For something even more unusual, guests can access exhibitions to experience a tropical rainstorm or network around a real iceberg. The venue has a purpose-built conference area so conferences or smaller meetings overlooking Edinburgh's famous Arthur's Seat are also possible. Health firm Miltenyi Biotec held an event there recently and UK sales office administrator Corinne Ross, who is based in Surrey, says: "It was a very successful day and went very smoothly. We have received many positive comments about everything. I only wish we had venues like this in our neck of the woods." Edinburgh Zoo's Budongo boardroom, which has capacity for 12, and the Budongo lecture theatre, for 170, are great options for livening up a meeting. Both have direct views of the gibbons' indoor area, which can provide a welcome distraction from a lengthy meeting. Alternatively book one of the rooms in the newly refurbished Mansion House, such as the Gillespie room, which can hold up to 100 theatre-style. The zoo, which is a registered charity, is also offering a new incentive activity called the Sky Trail, a raised-rope adventure course adjacent to the gibbons' outside area. "Edinburgh Zoo offers a most unique and enchanting location to hold an event. The service we receive from the team at the zoo is world class and our clients continue to be blown away by such beautiful surrounds," says Gavin Oattes, managing director of training specialist Tree of Knowledge. For a truly impressive venue, look no further than this neo-classical mansion, a short drive east of the city, which opened to the corporate market in May this year. Hidden from the road, guests will be thrilled from the moment they first spy the house, and even more impressed by the marble entrance hall and extensive art collection. It can hold 120 for banqueting, 400 for a reception, 140 theatre-style or 5,000 in outdoor marquees. Delegates can enjoy falconry, clay pigeon shooting, highland games, walking on the beach, or a visit to golf club Craigielaw. Kuoni Destination Management project manager Carmen Sanchez says the house "has a lot of charm and there's no other like this in Edinburgh". Delegates at an event the agency ran recently praised the food, service and were "amazed by the amount of history and art you can enjoy in there", adds Sanchez. This new cookery school opened at the end of last year and is based in the city centre. The venue has a theatre that allows 40-50 delegates to watch cookery demonstrations or lectures, and holds receptions for up to 70. The private dining room can also hold 36 for meetings, 50 for a reception and has views across Queen Street Gardens. After meetings, delegates can get their hands dirty by enjoying a private class and learn how to make a three-course meal or relax with a cookery demonstrations or a wine/whisky tasting. The main teaching kitchen can hold up to 16. The head of the school Fiona Burrell is the former principal of the famous Leiths School of Food and Wine.